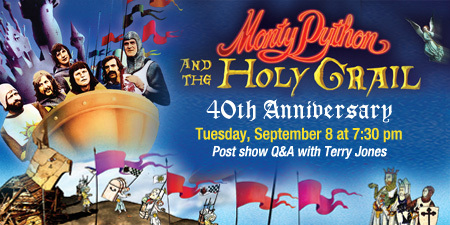 We’re giving away a 4 pack of tickets to see a screening of the classic Monty Python and the Holy Grail on Tuesday, September 8 at 7:30PM. In addition to the movie screening, co-writer and cast member Terry Jones will be in attendance for a special Q&A session afterward! Enter to win by filling out the form below, and we’ll contact the winner on Thursday, September 3rd!